Theatre Royal Haymarket London - Only Fools and Horses, Where is Peter Rabbit? 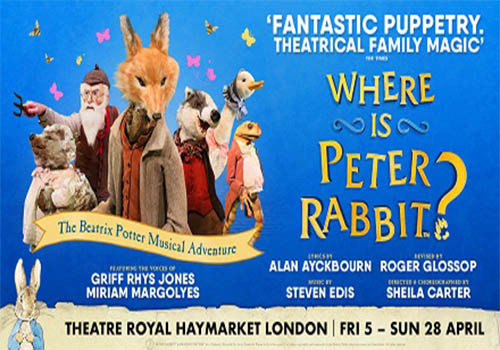 Hop on over to the Theatre Royal Haymarket and immerse yourself in the magical world of Beatrix Potter. Where is Peter Rabbit? features puppetry, original songs, and a sprinkle of magic – as well as all of your favourite Beatrix Potter characters. The best loved cockneys of the entertainment halls of fame, Del Boy and Rodney take to the stage for the new West End show Only Fools and Horses the Musical. Written by the series’ writer John Sullivan’s son, Jim Sullivan, alongside comedy icon Paul Whitehouse, the musical features music by Chas and Dave. Witness the dodgy deals, the London markets and the hilarious japes when this heart-warming show arrives at the Theatre Royal Haymarket. Whilst the postal address is Suffolk Street, the Theatre Royal Haymarket box office is accessible from the Haymarket entrance and is open Monday – Saturday from 10am-8pm. Tickets arranged for collection can be picked up from the theatre’s box office within the hour before the performance is due to start. Collectors will need to bring their booking reference and the card on which the purchase was made. One of the West End’s oldest theatres, the Theatre Royal Haymarket officially opened in 1720 with a French play entitled La Fille a la Morte, ou le Badeaut de Paris. Successful early productions included The Beggar’s Opera (1729) and The Dragon of Wantley (1734). The current building opened in 1821 with a production of The Rivals, followed by Our American Cousin (1862) An English Gentleman (1871) and a number of burlesque performances. Following this, the Haymarket became synonymous with light comedies, such as The Palace of Truth (1870), The Wicked World (1873), Charity (1864), The Zoo (1875) and the premiere of Engaged (1877). Oscar Wilde premiered a variety of his productions at the theatre, including A Woman of No Importance (1893) and An Ideal Husband (1895). During the late 19th to early 20th century, the venue made its name hosting plays and comedies, including Under the Red Robe (1896) and J.M. Barrie’s The Little Minister (1897), as well as Bunty Pulls the Strings (1911), Ghosts (1914) and The Widow’s Might (1916). Soon, productions began to run for an extended amount of time, with J. M. Barrie’s Mary Rose (1920) running for 399 performances and Yellow Sands (1926-1927), which ran for 610 shows. Notable productions after this included The First Mrs Fraser (1929), starring Marie Tempest, Noel Coward’s Design for Living (1939), The Importance of Being Earnest (1948) and a production of The Glass Menagerie, starring Helen Hayes. The mid 1900’s saw some rarer plays performed, such as Flowering Cherry (1957), Terence Rattigan’s Ross (1960), Ides of March (1963), directed by John Gielgud and A Voyage Round My Father (1971-1972), starring Alec Guinness. By this point, the Theatre Royal Haymarket was known for a quick turnover of plays featuring star casts. Productions of note were Virginia (1981), with Maggie Smith, Hobson’s Choice (1982), starring Penelope Keith and Chekhov’s Uncle Vanya (1982) and The Cherry Orchard (1983). Throughout this time, the theatre produced many plays in repertory, including The Aspern Papers (1984), with Vanessa Redgrave, who also appeared in Antony and Cleopatra (1986). Toward the end of the 20th century, works from a number of playwrights were performed at the theatre, comprising Terence Rattigan, John Osborne, J.M. Barrie, David Mamet, Jean Anoulih, Tom Stoppard, Henrik Ibsen, Oscar Wilde, Neil Simon and more. Renowned actors such as Derek Jacobi, Robert Lindsay, Alan Bates, Martin Shaw, Jessica Lange, Steven Berkoff and Richard Dreyfuss appeared at the theatre. 21st century productions have included The Royal Family (2001), starring Judi Dench, Lady Windermere’s Fan (2002), starring Vanessa Redgrave and Joely Richardson, The Breath of Life (2002), with Maggie Smith and Judi Dench, Ralph Fiennes in Brand (2003) and When Harry Met Sally (2004). 2005 saw Victoria Wood’s hilarious Acorn Antiques the Musical premiere, starring Julie Walters and Celia Imrie, followed by Hay Fever (2006), Seven Brides for Seven Brothers (2006), The Last Confession (2007) and The Country Wife (2007), amongst many more. Trevor Nunn’s Olivier Award-winning production of Flare Path transferred to the theatre in 2011, starring Sheridan Smith, followed by the National Theatre’s One Man, Two Guvnors (2012), Fatal Attraction (2014), Great Britain (2015), Taken at Midnight (2015), starring Penelope Wilton, Harvey (2015), Elephant Man (2015), starring Bradley Cooper, and McQueen (2015). 2016’s shows included Mr Foote’s Other Leg, Bad Jews, How the Other Half Loves and Breakfast at Tiffany’s, directed by Nikolai Foster and starring Pixie Lott. Dominic Cooper then took to the stage in The Libertine, before the RSC’s Love’s Labour’s Lost and Much Ado About Nothing came to the theatre in 2017. Damian Lewis and Sophie Okonedo starred in Edward Albee’s The Goat, or Who is Sylvia?, followed by Edward Fox in Sand in the Sandwiches and the RSC transfer of Queen Anne, starring Emma Cunniffe and Romola Garai. 2017 rounds off with dark comedy Venus in Fur, starring Natalie Dormer and David Oakes, followed by Christmas With The Rat Pack. The Rat Pack - Live from Las Vegas kicked off 2018, featuring well-known hits from the iconic trio. Jonathan Munby directed Bryony Lavery's acclaimed play Frozen, starring Suranne Jones, Jason Watkins and Nina Sosanya. 2018 also sees the Maly Drama Theatre return with limited performances of Uncle Vanya and Life and Fate, followed by Christopher Hampton's adaptation of Molière’s Tartuffe. 2018 saw West End transfer of cult hit Heathers the Musical, followed by Take That musical The Band. 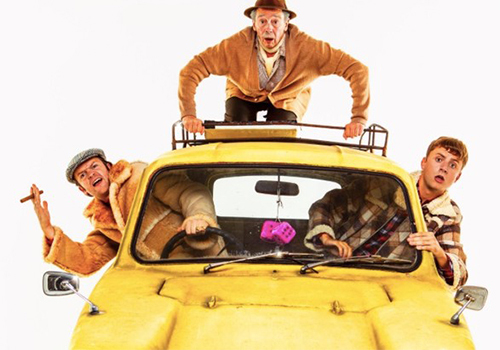 2019 sees the world premiere of new musical Only Fools and Horses. In April, family show Where is Peter Rabbit? hops into the theatre to play morning and early afternoon performances.